I have grown up without a pressure canner and not knowing what water-bathing is. But I know how to preserve fruit. 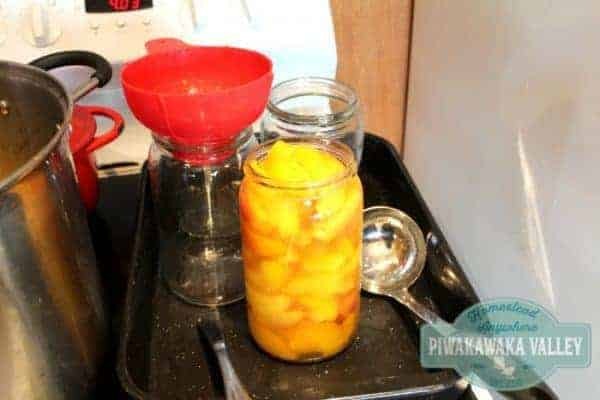 This is a super easy technique for canning fruit that is great for beginners to learn. Stone fruit is one of my favourite things to eat canned. There is nothing quite like opening a bottle of sunshine in the middle of the cold winter! 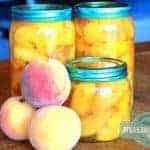 Below I will show you the overflow canning method for preserving stone fruit – this includes peaches, plums and apricots. Many people prefer not to use the overflow method, but for a high sugar syrup with fruit, it is quite safe. If you prefer to water-bath, cover the jars completely with hot water and simmer for 10 minutes. Remove carefully and allow to cool. 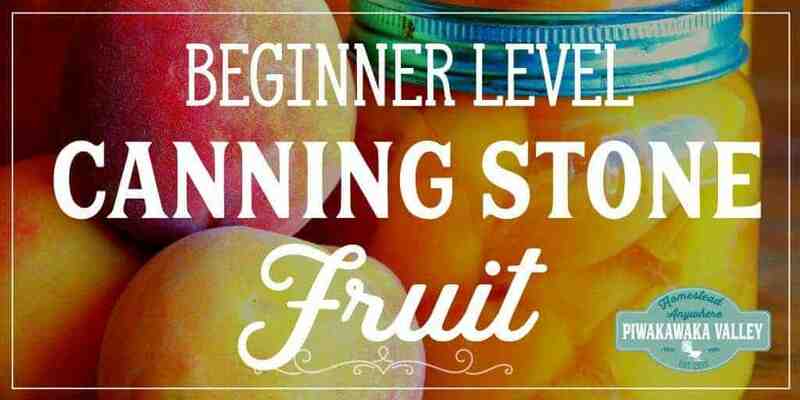 Fruit selection is quite key when it comes to canning fruit. You want to choose fruit that is only just ripe. If it is juice-runs-down-your-arm ripe it is going to turn to a squishy mess when you try to can it. Choose fruit that smells fragrant, but is still firm to the touch. Avoid green fruit, but maybe 24 hours later it will probably be perfect. Avoid using bruised fruit for canning. Cut the bruised pieces of stone fruit off and keep them and the pits for making stone-fruit vinegar with your leftover fruit syrup. 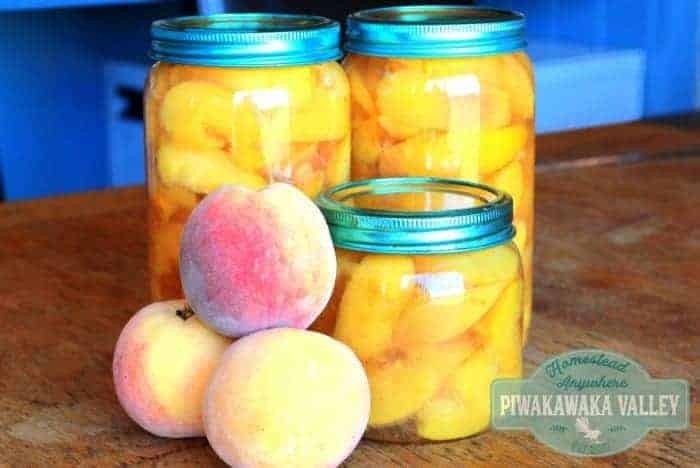 Super easy overflow canning method for preserving stone fruit. 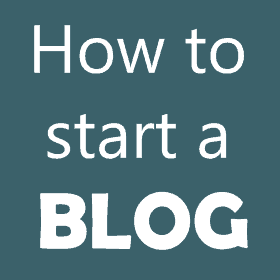 Step by step instructions for beginners. Chop up your fruit. 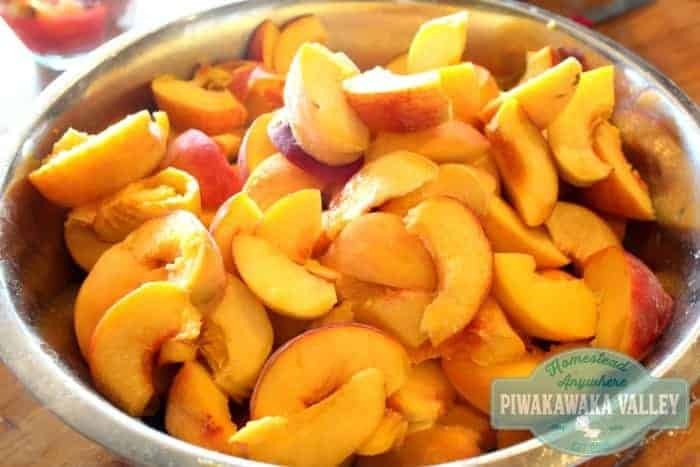 Peaches and plums are easiest done if you cut right around the fruit (top to bottom then right around to the top again) then cup the fruit in both hands and twist them apart. Remove the stones and any bruises and set aside to make vinegar. In a very big pot place the water and sugar and bring it to the boil. Heat your oven to 200F/100C. Place your clean dry jars in to heat on a tray or in a dish for 10-12 minutes (no longer or they will crack).When you remove the jars from the oven bring the tray and everything. This makes it easier to move them and reduces the cold shock. 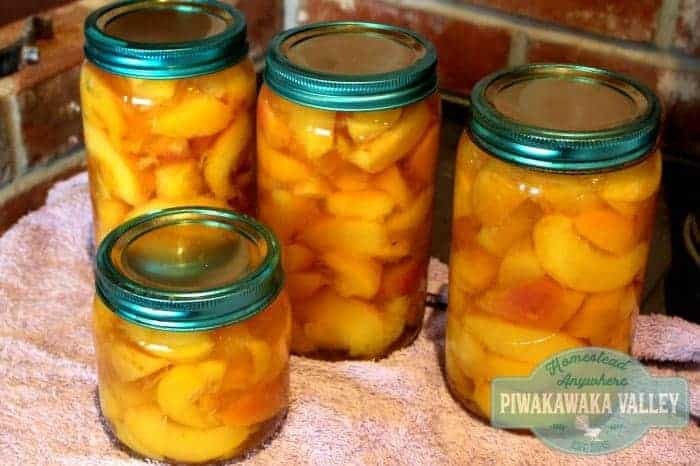 While your jars are heating carefully add all your fruit to the boiling syrup and cook for 10-15 minutes until JUST soft. Working one jar at a time fill right to the brim with fruit - I like to scoop it out with a slotted spoon.Fill the jars with syrup. Keep the pot on a low simmer while you jar up all your fruit. Run a knife down the inside edge of the jar all the way around to release the bubbles. Top up with more syrup so that the jar is totally full. Wipe the rim with a clean dry cloth. Place a clean lid and ring on the jar and screw to "finger tip tight" which is as firm as your can tighten it with using just your fingers. Set aside on a folded towel to cool and move on to the next jar. Once the jars are totally cool you can label them and remove the ring to check if they have sealed properly.Any jars that haven't sealed will need to go in the fridge and be used within the week. You can leave the rings off of the jars. Store at room temperature for up to 2 years. Discard any that develop bulging lids or look or smell wrong (none of these things should happen if you are careful with your sterilisation). 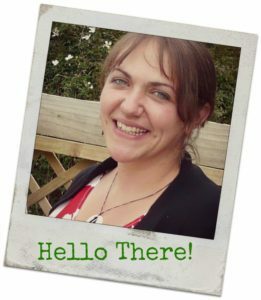 Why do you say new lids – would one not use previous lids? I also don’t understand why you remove the ring; would the lid be immovable if vacuum sealed? I have only ever made jam and marmalade but have never known about checking the lid. I would really like to do fruit and veg as my freezers gets too full every summer. My son goes around the neighbourhood giving frui and veg to friends. Hi Vivian. If you are canning in proper preserving jars, the lids are two piece – a seal (it is flat and while you can reuse them, it is not recommended as they they often don’t reseal, though you are welcome to try – I reuse mine a few times) and a band (it is like a circle that you can put your hand through the middle. The bands hold the seals in place while the vacuum forms. Once it has, the seal is stuck on and you can remove the band without concern. 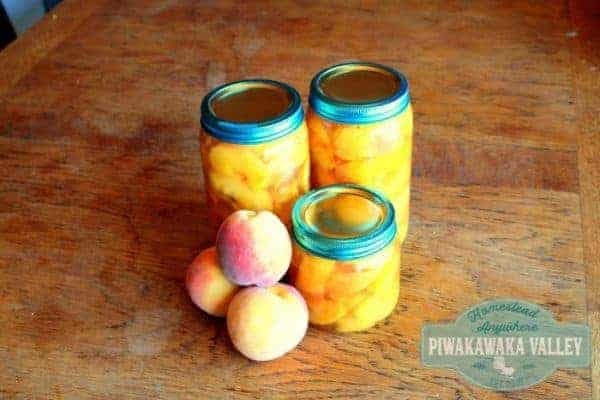 You might want to check out my post on pressure canning, as vegetables need to be either pickled or done in a pressure canner to remain safe to eat.